During the recent Durban Airshow, I had the opportunity to sit down with the current pilots of the Silver Falcons and chat to them about their flying activities. 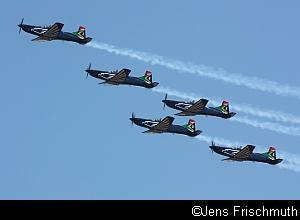 The Silver Falcons, the Aerobatic Display Team of the South African Air Force, has flown about 600 displays since it was formed in 1967. To date, 93 pilots have flown for the Silver Falcons, representing 70 different teams (whenever team members change, a new team number is allocated). 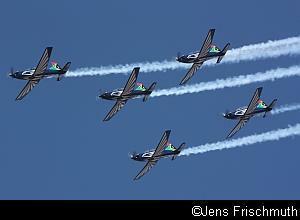 The team flew the Aermacchi MB326 Impala until 1997 and then changed to the Pilatus PC-7 Mk II Astra. The current team (Team 70) consists of team leader Maj. Scott Ternent, Capt. Roy Sproul, Capt. Buti Tsebe, Capt. Gerhard Lourens and Maj. Nico Frylinck, who is also the team's soloist. Team 70 flew its first public display together about 18 months ago on the 31st of January 2009 and as Maj. Ternent says: "This is quite unique in Silver Falcons history. As a single team that hasn't changed, I don't think there has been a team that has been that constant for that period of time, which has been evident because we have been around for 43 years and there have been 70 teams ... this is quite a good achievement." The members of the team are all instructor pilots at the Central Flying School at Air Force Base Langebaanweg in the Cape, and Capt. Roy Sproul is the Chief Flying Instructor at the school. When asked about their daily activities at the CFS and the amount of flying they do, he explains that the members of the Silver Falcons "are generally the more senior guys at the school, currently anyway, so we don't have dedicated students necessarily. We are called frequently to do check rides with the students or instructors for that matter. The newer instructors tend to do a lot more flying than we do just to build up their hours and get their instruction experience but yes, we still do a fair amount of flying. I don't think any of us can complain, especially when you look at other air forces, the financial climate etc., I think we do well." Maj. Ternent adds to this: "As an instructor at Langebaan, there is an opportunity to fly lots of hours and it just goes about an individual and their enthusiasm because there are always sorties available, there are always opportunities to fly and like Roy says, we might not always have those opportunities because when you are in management, generally a lot of paperwork etc. follows. But every opportunity we get to fly, again, hats off to the guys that are in the team, in that if you are going to check logbooks etc. you'll be surprised outside of just the flying we do as a team, the guys work just as hard as the guys that are giving the normal everyday line instruction. It is a lot of work but at least we love it and enjoy it." Flying for the display team comes second to the other duties of the pilots and ground crew of the Silver Falcons. Maj. Ternent explains: "This is really a part-time thing for us in that most of the flying is done when all the other flying is done as a flying instructor. We have had times where we have not flown together for 6 weeks. Everyone might be a bit rusty but within a sortie everyone tightens up and its like you have been flying together for a long time ... we don't have the luxury of flying together all the time but when we do we make the most of it. This highlights again the quality of the guys flying ... and generally what we are hopefully creating in the air force. The quality of the pilots is exceptional in my opinion." Capt. Gerhard Lourens adds: "The upside of that is that there is little space for complacency. Most of the accidents in display teams are as a result of complacency because they are flying three times a day every day, it is easy to let your guard down. That's a luxury I think we don't have in our outfit." The Silver Falcons' displays are flown to showcase the skills of the Air Force pilots. Team leader Maj. Ternent says: "The quality of the pilots is exceptional in my opinion" and Maj. Frylinck adds: "We are actually just showcasing what there is in the military, in the air force. 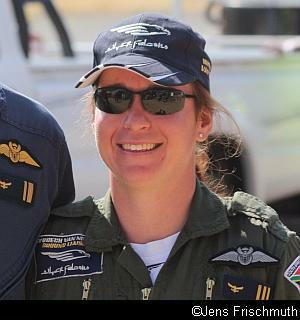 We are not unique, you can actually take 90% of the pilots at Langebaan and teach them to do what we do and that's the nice thing that there are still skilled pilots in the air force." 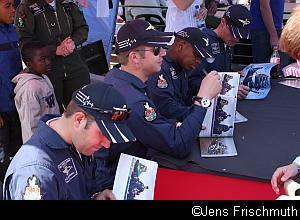 The Silver Falcons make themselves available at events to meet the public and sign posters and books. Maj. Fryinck says it is important for the public to "see the people sitting inside the cockpits, to see that we are also only human beings like everybody else, we are not any different, and this is always a nice experience." Maj. Ternent adds: "For me, a highlight with the public is that people expect you to be different but when you've been around them and you've been able to socialise with then and spend time with them, it's so nice to get comments like "geez, you guys are so down to earth" and "you are just normal guys who just like to have fun" and stuff like that, and that for us is a compliment. That is the whole idea. You are not special, you are doing something that you love and you have had an opportunity that not everyone gets. So you make the most of it. That's part of what we need to do and that's generally where the hard work starts because you need to be a good role model." Maj. Ternent says that putting together the display routine "is something that the team does. If we want to change something we will spend a lot of time thinking about it and the idea is that each pilot adds their own flavour to the display. So if someone brings a new idea, the idea would be to try and add it somehow, so that at the end of the day you have got a display that is 12 minutes long and hopefully each person has contributed a percentage to it. So we definitely rely on each other to put together something that is practical as well as spectacular we would hope, and the people enjoy, certainly an effort from everyone." Asked about their highlights together, Maj. Ternent says the following about their participation in the opening ceremony of the 2010 FIFA World Cup: "It was awesome, that's for sure. Only 3 billion people, no pressure. An experience I think that all of us, in 50 years time, if we get that old, will look back and remember. I am sure I will that's for sure. Quite emotional, I think." Capt. Sproul includes "the Presidential Inauguration, definitely. It was our first big public display as a team; it is definitely one that stands out." Maj. Scott Ternent adds: "Also, I don't think there has been a team that has had that much exposure with regards to flying on big aircraft. 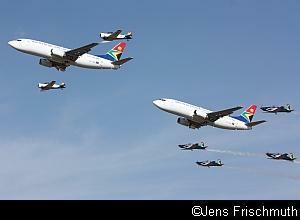 We have flown a number of formations on the various types of Airbuses that South African Airways has. A world first, I am sure, was the two 737s flying in formation and we got to fly formo on them with Harvards, you don't see that around the world." For Capt. Buti Tsebe, "the FIFA World Cup was the highlight, and the opening of Soccer City." Maj. Ternent adds: "We don't really have lowlights, every experience we have as a team is in some way a good experience. What has been so nice about us being together for so long is that each guy becomes a personal good friend and you understand each other and you know the way the guys think ... so when we go to an air show it is always a highlight because something happens just through an effort from the team to make it a good experience. You become friends with the guys because you can't help it. You don't necessarily start off as friends but at the end of the day you feel like if you are going to go to war with someone you will go to war with these guys. You trust them, you know how they operate and how they think and you know they value your life and you value theirs." The newest member of the team is Capt. Heybrech van Niekerk, the team's safety officer. Asked about her experiences with the team so far, Capt. van Niekerk replied: "This is the first time I have been so looked after. The team and their flying abilities, it's amazing. You sit with them and they teach you the things, they help out where they can." She was also impressed with the team members' interaction with the public, noting that "the interaction with the civilian people is for me also astonishing. 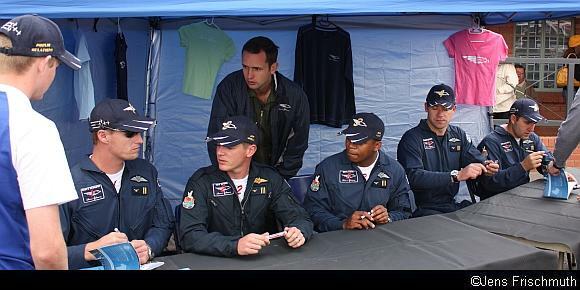 Because they get out of their aircraft, they walk straight to their signing posts; they sit down and meet all the people". She describes being apart of the team: "I am not ferrying the spare aircraft, so I get to fly with them. 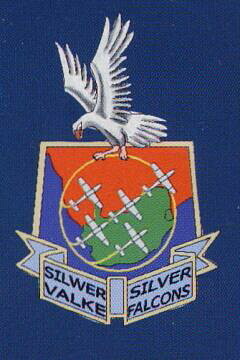 For me it's a great honour to fly with them, I try to keep their name up high because they are the Silver Falcons. So when they climb into their aircraft, it's for me the greatest honour. The guys are really exceptional. I don't think the Silver Falcons have ever gone to this level ever in their history and the next team that has to replace them has got pretty big shoes to fill." Maj. Ternent has the following to add: "Heybrech has been a real star to the team so far. You can really ask her to do anything and she does it about ten times better than what you expect anyhow." Thanks to Lt. Brian Goldschmidt, Andrew Schofield and the pilots of the Silver Falcons for making this article possible. Below is a collection of photos of the team.